There’s more to last week’s story about my misguided adventure with a busload of students. After negotiating through an additional seven miles of bumpy dirt road, we came to a water crossing within sight of a paved road. This time, I stopped the bus and the boys hopped off and built up the banks of the road with more rocks BEFORE I attempted to drive over. When we finally turned onto a paved road, the students cheered. Four miles later, we arrived at the entrance to the campground. At last! We would have a hot supper enough sunlight left to set up camp after we ate. I pulled in to the group camp area and looked anxiously around for the advance team and the tables laden with food. When I saw nothing, I wondered if I had pulled into the right spot. Unfortunately, I had. We let the kids off the bus, and they stood around in dazed groups. Our six-hour trip had turned into a twelve-hour odyssey. Just then the advance team pulled up in the Tahoe—without the trailer full of food. It turns out that Google Maps had led them on another, equally perilous journey. Eventually, they abandoned the trailer and headed to camp to find help. We gathered the kids together and explained what had happened. A few of them groaned with disappointment, but they quickly got to work unloading the sleeping bags from the bicycle trailer. The staff decided to serve what little food we had and send the kids to bed. It might take all night to rescue the trailer contents, one load at a time. Fortunately, we actually had a little food in the back of the Tahoe. A Handful of Fruit and a Cookie? That’s how we ended up serving a supper of nothing more than cookies and a handful of cut-up fruit. We had no bowls or spoons or even napkins. After blessing the food, the kids shivered a bit in the wind and settled down to eat. They laughed and chattered about the day’s adventures, and came back for more cookies. Around that time Pedro drove up. He had arrived three hours earlier, but when none of us showed up on time he got worried. After setting up our tent and exploring the campground, he’d driven eight miles into the nearest town to find cell service. Unbeknownst to him, none of us had cell service on our unimproved dirt roads. He and one of the Tahoe drivers headed back out to the trailer’s location (about 45 minutes from camp), and the rest of us started setting up camp with what little we had. It turns out that the girls had more stuff than the boys. They had followed instructions that morning about putting their sleeping bags AND tents in the bicycle trailer. The boys, on the other hand, ended up with just their sleeping bags. No one had toothbrushes, pajamas, or more warm clothes, though. Nevertheless, they cheerfully set up camp with that they did have. Some of them chose to sleep on the bus out of the wind. We settled down to sleep and hoped that Pedro would figure out the trailer problem in one trip. The next morning, I went over to the group camp to help out. Pedro had arrived around 11 with the trailer in tow, and some of the kids had woken up long enough to grab their suitcases and extra bedding. Others had just conked out for the night. The temperature hovered around 38, so we set up the cook stove first thing in order to heat water for hot chocolate. Boys rolled out of their sleeping bags and started setting up their tents and helping prepare breakfast. We discovered that in loading the trailer the previous day, someone had forgotten to bring the cups. The kids drank out of cereal bowls for a week. You’d think that after spending the night sleeping on the ground without tents, or slumped over on a bus seat, the kids would have a bad attitude. Not so. They woke up happy and laughing over the previous day’s adventure. They had attitude all right—positive attitude in spades. How often in my life do I whine and complain when little things go wrong? I make mountains out of mole hills and spread my sour attitude like mustard at a picnic. It stains and taints everything it touches. My poor students had a handful of fruit and cookies for supper. 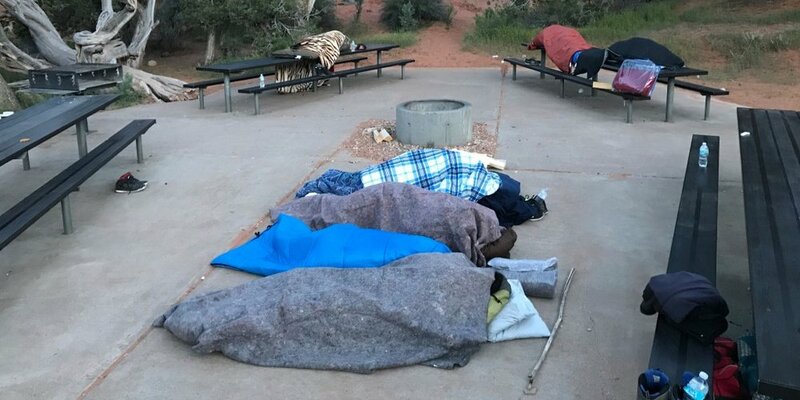 They camped under the stars on a cold night without all their comfort items. They drank out of bowls for a week and never complained. Their positive attitude humbled me. Older PostWhen You Plan a Trip, Check a Map!